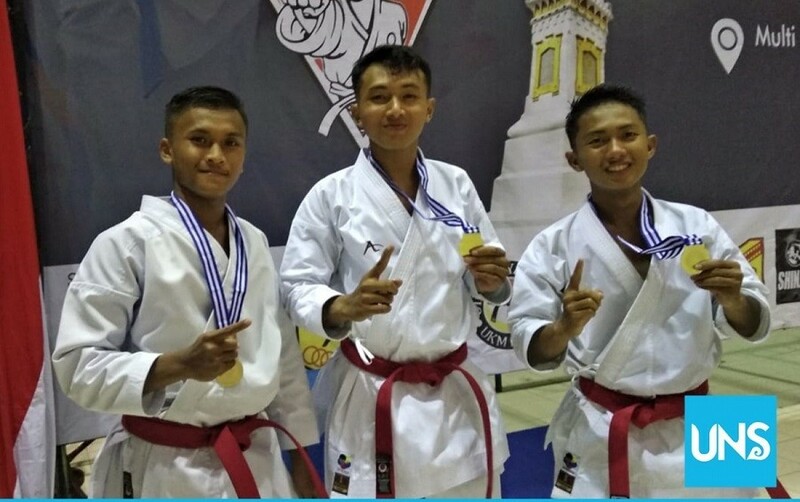 UNS – The Karate Team of Universitas Sebelas Maret (UNS) Surakarta achieved gold medal in the 11th National Championship (Kejurnas) Universitas Islam Negeri (UIN) Sunan Kalijaga (Suka) Cup. The championship took place in the Prof. HM. Amin Abdulah Building UIN Sunan Kalijaga Yogyakarta on Thursday (1/24/2019) and Friday (1/25/2019). Reportedly 46 contingents attended and nine athletes from UNS participated in this championship. In the 11th UIN Suka Cup, UNS achieved five medals, one gold medal, one silver medal, and three bronze medals. The gold medal was successfully obtained by Kata Male Team which consists of Cukat Ainun Jiwo, Bayu Kusuma Jati, and Yogi Pranata. Meanwhile, Yogi Pranata achieved silver medal from the category of Male Kumite under 21 – 78 kilograms (Kgs). On the other hand, the bronze medals came from the category of Senior Female Kumite under 68 kgs by Aprilia Yustiana, Male Kata by Bayu Kusuma Jati, and Female Kumite under 21 – 53 kgs by Ristie Yuni Astuti. Ratih Astari, the charge of the athletes, revealed that there were no obstacles faced during the athletes training period. “Before joining this championship, all the things are all well-prepared so it increases the spirit of UNS Karate Team to give all their best,” she said, Thursday (1/31/2019). She hoped that the contingents of UNS Karate were not satisfied enough with the result then would intensify the training process ahead the 11th Sebelas Maret (Semar) Cup which is an inter-students Karate championship held by UNS Inkai Club on the next March, 8 – 10 2019.